This is a “live cyclone coverage” that started from May 24 and will end on June 13. From June 13, normal articles of Pakistan Weather Portal (PWP) will resume. 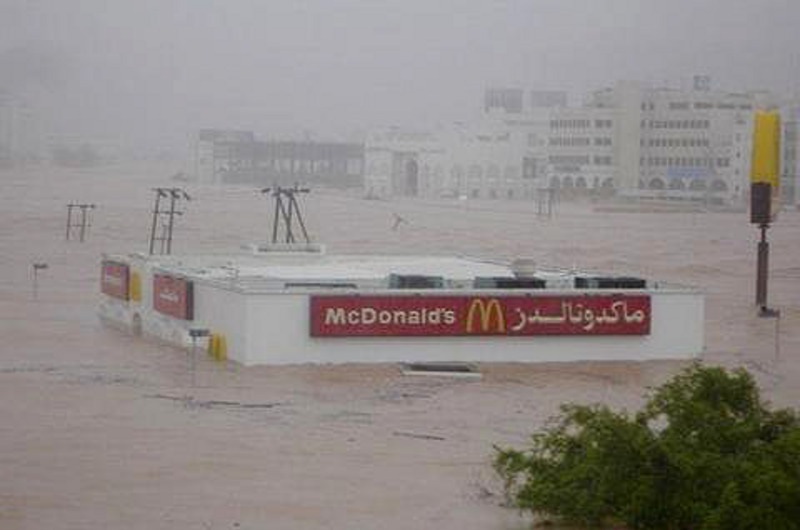 McDonalds submerged in Oman due to Gonu - I'm lovin it ! Since the forecast of a possible cyclone in the Arabian sea emerged on May 23, there had been much talk about its possible track and intensity. Cyclones in the Arabian sea are rare and stronger ones are extremely rare but not unheard. A little disturbance in the Arabian sea sends chills to the coastal localities of Pakistan, Western Indian and Oman. Pakistan is a country which rarely gets to see cyclones before and after the monsoon season, while the eastern India gets the highest number of cyclone than any part of the North Indian Ocean. Oman on the other hand, well, cyclones are rare guest in this small Arabic state but since past few years there had been greater than usual tropical disturbances in Oman. The reason? global warming and high sea temperatures than usual, and the frequent number of extra-tropical waves (western disturbance) over Northern Sub-continent that blocks the cyclones from moving in a Northern direction. Gujarat- Maharashtra coast in India. The most likely landfall of ARB 01 is Oman as the western disturbance is expected to approach the Sub-continent on June 1. Conditions near the road to Oman will also be favourable that is low wind shear. There is already a lot of moisture over Arabian sea that will keep fueling the system. Therefore Oman is likely to be the final resting places of ARB 01. Gonu formed on June 1 and dissipated on June 7. First and final prediction – It was always forecasted to make landfall in Oman. But Gonu was not expected to become a category-5 Super cyclone, thus breaking all past records. Phet formed on May 30 and dissipated on June 7. First prediction – Phet was expected to hit Gujarat and adjoining Sindh as a category-2 hurricane. Second prediction – In second warning, Phet was expected to hit Sindh and adjoining Gujarat as category-3 hurricane. Third prediction – In the third warning it was expected to hit Karachi and Sindh as a low-end category-3 hurricane. Fifth and final prediction – In final warning, Phet was expected to hit Oman as category-5 hurricane but in fact the storm hit Oman as category-4 and then re-curved back to Pakistan and India as a weak depression. Though these two storm did not form during the first week of June but they were the first Arabian sea depressions of 2009. 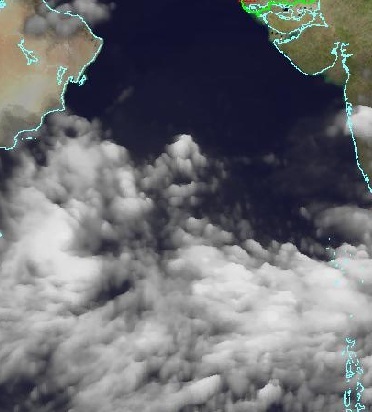 ARB 01 formed on June 23 and dissipated on June 25, it formed near Mumbai and moved from Gujarat to Sindh, it caused rainfall in Karachi and Gujarat, while its remnants helped give life to another depression called ARB 02 that kept moving on open sea waters till it also dissipated on June 26. ARB 01 had winds upto 30 mph and it dropped 100 mm rainfall in Jamnagar, Gujarat. It formed on June 5 and dissipated on June 7. It was a depression with winds upto 30 mph. It was also forecasted to intensify into a deep depression then into a cyclonic storm . It was also first forecasted to hit Sindh-Gujarat border but it went to Oman as a well-marked low pressure area. So is it 2008 OR 2009? Will ARB 01 2011 follow 2008 path and bring rainfall to Oman? or Will it follow 2009 path and bring showers to a city that received last proper rainfall on September 13? This question will be answered on June 1. If ARB 01 2011 hits Oman then it will be the third year that a tropical depression formed in the Arabian sea during the first week of June and made landfall in Oman. The latest prediction is heavy rainfall to very heavy rainfall from June 4 with strong gusty winds in Karachi and coastal to south eastern Sindh..
Low pressure to form on May 31 or June 1 and after that it will gain strength to become a depression or deep depression..Latest forecast is either Mumbai or Karachi..
Can you please post the GFS model which predicts such thing? What is the GFS model? Depression will form near tamil nadu(India) ? GFS stands for Global Forecast System, Its used for long-range forecast..they are not always accurate..
Its still to early…wait 2 to 3 days.. I think depression will not form in ARB sea. There are only normal seasonal clouds over the Arabian Sea. Only chances of rain either in Oman or Karachi. It doesnt matter if ARB 01 does not come to Karachi..We are now entering monsoon season..Karachi will surely get heavy rain from July till August..
WILL there be A DEPression in ARabian after monsoon season ? Is there any more chance that cyclone will form in Arabian Sea? Both of you have same questions…there are chances of cyclones to form in Bay of Bengal and Arabian sea before or after monsoon season…but that does not happen every year especially to Arabian sea which is calm tropical basin..in next few days I see no tropical activty in both of these seas..
Latest sat pic shows some conviction in the clouds. Hope their will be some deep depression. If you need Gounu cyclone pic I have lot because I was present their. Pray for rain with blessing. “As expected, southeast Arabian Sea has tossed up an upper air cyclonic circulation off Kerala coast, the IMD said. The European Centre for Medium-Range Weather Forecasting sees the system anchoring the monsoon flows and helping the cause of the progress of rains along the coast to the north. The system could descend into lower heights and set up a low-pressure area off coastal Karnataka where the ocean water temperatures are well above 30 degree Celsius. In comparison, the seas off Kerala to just south are cooler. But an anti-cyclone let loose by the intervening westerly system could scare away the ‘low’ from approaching India coast, and the southeasterlies associated with the anti-cyclone could drive the sameout into central Arabian Sea. BBC and GFS models are predicting the same thing that the system will move towards south gujarat – mumbai coast and will makes it way farther in towards rajasthan in that case karachi will not get any good rains as the distance of low pressure will be far more from karachi …. Less chances of depression this week is important for cyclone. What about long range forecast? Looks we receive some good rain if Western disturbance system moves to central India by 1st June. Did anyone have any idea why Karachi weather radar is not in operation since last year? Long range forecast changing regularly and difficult to say right it. Till June 2, every forecast will keep changing and changing..clear picture on June 3..Stay tune..
hopefully there would be some great news regarding the deep depression hopefully it will come to karachi to give rains……. hi i am faisal.i think i am the biggest rainlover in world. i watch and check every website of weather daily. Please will you show me some website that is showing “Daily” rains in Balochistan and other cities you mentioned, give link…Climate is some thing that can be changed, this is some thing that I have told you every time and will keep telling you….This was the same thing that Accuweather blog was telling you since 2009..There is no curse in Karachi..and there are no daily rains in Northern Pakistan otherwise they would have been under rain water..
First of all, BBC forecast change within a day. Secondly, Karachi only got 95mm rainfall from phet on the time was sunday overnight and before one day of sunday it means from saturday BBC was showing heavy rains for saturday night. Dry and hot weather with some clouds in Karachi during next few days..
when will you be posting the new article regarding monsoon in pakistan this year as well as the updates regarding the depression in arabian sea?? Updates of Pakistan will be issued tonight…Monsoon of Pakistan series will be issued on June 13.. The BBC maintains there forecast of Gujarat-Mumbai landfall since many days…GFS is changing every day..
GFS is changing every day and BBC maintains Gujrat Mumbai landfall but which is most correct? Yes PMD has confirmed a cyclone in the Arabian sea that will affect Thatta, Badin and Sindh..
From where did you got this news … i dont see anything related to cyclone on PMD website … is it on news channel or your’e in contact with PMD ??? I think its pakmet who has said that TC will form in Arabian sea and cause rainfall in SIndh check the link a give you…But I think that chances are now fading..
when did they say it …??? Heating increasing in enitre sindh is this sign of tropical trouble? Can they be formed into a Cyclone? If yes, then how much chances?? And if it forms, will it come to Karachi?